This is a preview clip for one of the episodes of the Droned TV series which was co-produced by AirVuz and aired on the Science Channel in the summer of 2016. In this episode, the Pigeon Vision crew gets hired to take drone footage of the Capilano Suspension Bridge in Western Canada. The 70 meter (230 ft.) span over the Capilano River north of Vancouver was built in the late 19th century, and completely rebuilt in the mid-20th. 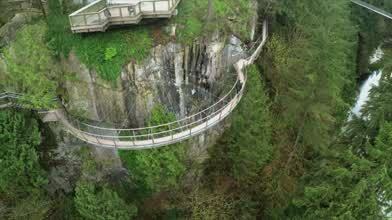 Privately owned, it's a major tourist attracting in British Columbia. Description: Ryan and Dani hang out in Vancouver on the Capilano Bridge.